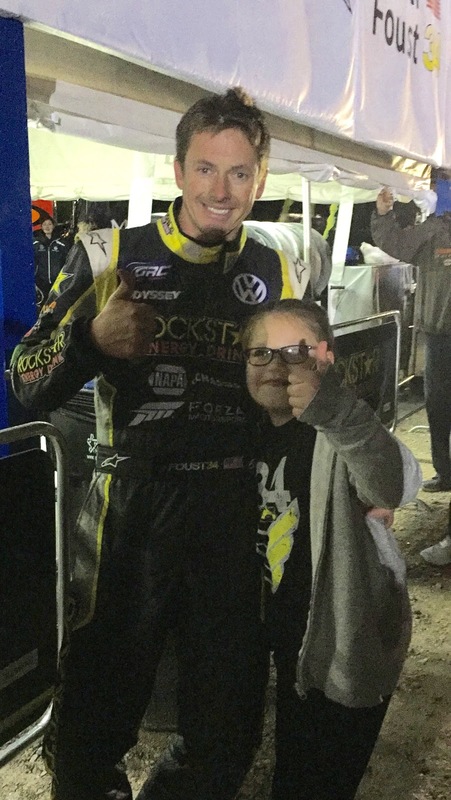 November is when the GRC Finale in Las Vegas takes place and one driver in particular has a special place in Hailey's heart...Tanner Foust! Hailey met Tanner 2 years ago when we were invited through Make a Wish Southern Nevada to be Tanner's special guests along with some other kiddos. When Hailey sees Tanner on tv she knows him right away from the autographed posters she has on her wall in her room. We didn't have tickets to this years race but I knew this was something Hailey would love to do again. The first time we went it really had a big impact on Hailey and really stuck with her. I had read on social media that Tanner Foust and Scott Speed (The drivers for Volkswagen) were going to be near by where Hailey has therapy and on a whim I decided to stop by after. We really don't go anywhere without Hailey making friends and this event was no different. As we stood in line Hailey was getting antsy, it was funny to see her excited for race car drivers. This little girl who loves, pink, frozen, and sparkles and she likes cars. She gets that from her dad. This is not a fluke or sudden thing either, remember how she wanted to go to the NHRA too? As soon as Tanner saw Hailey walk up he knew her right away! He also could have suddenly remembered her because she was wearing her Hugs for Hailey shirt...wink wink...LOL! He did say that he remember her from the Make a Wish thing though and from our tweets on twitter. Of course there were lots of Hugs to give and to prove that Hugs make people happy check out the people in the background in the photo below. They are smiling just from seeing someone get a hug!! Hailey loves giving hugs and this hug was because she was given a brand new Tanner Foust t-shirt and she was thrilled! At the meet and greet they had raffles and guess who one tickets to the races....???? We were so excited to get to take Hailey again this year! Hailey left the event with lots of SWAG! Autographs, tickets, hats, and shirts! Look at this happy girl with her two favorite drivers! The day of the races came and Hailey was ready to go representing her driver! Then all the sudden...THUNDER STORM!!! It started pouring, and it was muddy, and so so so cold and windy but we bundled up because Hailey was over the moon excited to go! Now these seats weren't like the VIP seats we had two years ago, and that's fine. These were out by the bleachers with no awning to keep away the rain, but Hailey did not care! In between races we went to the pits and made sure to wish our guys good luck. When we saw Scott Speed he actually invited us to get out of the rain and stand with his crew under the tent! What a great guy! We actually did get great front row seats though. Hailey had to wear ear protection since she's become so much more sensitive to sound which is a common thing with Leukodystrophy kids. Hailey had smiles the WHOLE time and she'd cheer out loud and she really did love this. I love seeing her so happy doing something where you could be crabby about the weather situation and being cold, wet, and muddy. Our happy girl! We don't take Hailey to meet celebrities, we let celebrities meet Hailey. Thank you to everyone who helped us get Hailey to this event. We really appreciate it. We will continue to make memories with our girl every chance we get!